JACKET BY RAG & BONE AVAILABLE AT MADISON, L.A., SCUBA NEO POLYESTER JERSEY T-SHIRT BY MACHUS, JEANS BY HUDSON, SUNGLASSES BY DIOR HOMME, AND SHOES AND EARRINGS TALENT’S OWN. PLAID SHIRT BY ALEX MILL AVAILABLE AT MADISON, L.A. AND SCUBA NEO POLYESTER JERSEY T-SHIRT BY MACHUS.
. The spurned have offed themselves, the unspurned have offed themselves, too. In no other medium are we more forcefully reminded of love’s side effects than in music. Music reminds us, on a daily basis, of love’s damaging power on psyche and soul. 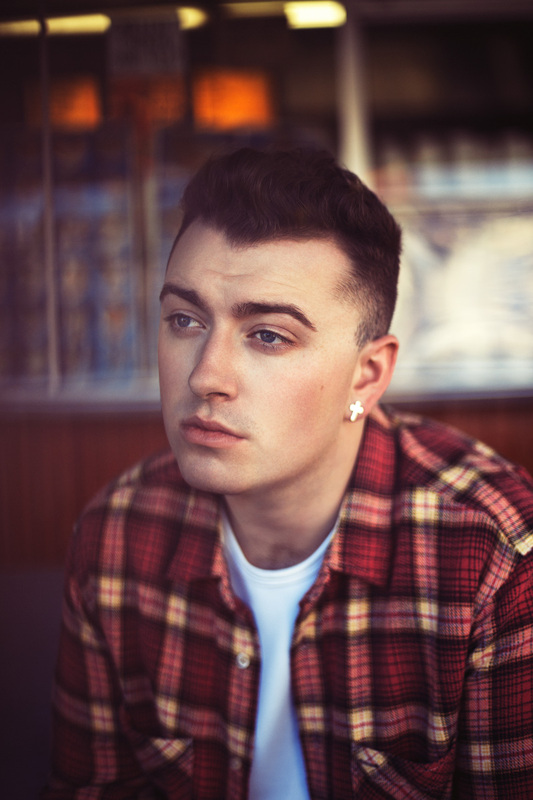 British troubadour Sam Smith is quickly becoming a pillar of romantic lyrics in modern music. After contributing vocals to Disclosure’s “Latch,” Smith went on to release his own EP, flexing his talent. Then he won BBC’s Sound of 2014. Now he speaks with us about games, love, and, of course, Whitney Houston. This issue’s theme is games [and sharks]. Let’s talk about the game of love. In Wayne Fontana and the Mindbenders’ 1965 hit “Game of Love,” the lyrics maintain to “Put your arms around me, hold me tight / Play the game of love.” Do you play the game of love? Do I? Of course I do. I think every single person in the world does. But I play it in a very different way at the moment. Is love your biggest inspiration? It is. I’ve never been in a relationship before. The love that I extend all my music from is unrequited love. It is a form of love. Sometimes unrequited love is almost more romantic. I completely agree. I think it’s sometimes more painful. Do you need to feel pain when writing a love song? I think you need to feel, yes, I think you do—even if you’re so happy you’re in pain. I think good art is made by pain and upset. Do you believe in love at first sight? No, I don’t, because I’ve never seen or experienced it. I think you slowly fall in love with someone. Who was your first love? I think it was probably Whitney Houston. I mean I fell in love and someone didn’t love me back when I was about 13, but Whitney Houston was probably my first love. What other games do you like playing? I was not too much of a game guy; I normally just sat in my room and listened to female singers. What is your ideal writing space? I’d say something really crazy like a beach in the Maldives, but sometimes it’s the little shifty places where you are that you get the most stuff out of. Photographer: Fred Jacobs at fredjacobs.net. Stylist: Zoe Costello For Themagnetagency.com. Groomer: Debbie Gallagher for opusbeauty.com. Grooming Notes: Antaeus after shave lotion by Chanel. Sumotech by Bumble and bumble.